Blue Kale Road: Pumpkin Cake with Salted Honey Caramelized Pears and Whipped Cream: Hello Fall! 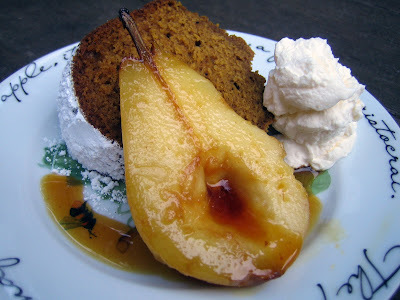 Pumpkin Cake with Salted Honey Caramelized Pears and Whipped Cream: Hello Fall! There is a crispness in the air and, despite the calendar saying summer is here for another week, I say fall has arrived. My sons are outside throwing a football around, leaves are blushing red on the maple trees, Honeycrisp apples are in the market and I am craving autumn cooking with apples, pears and squash. Lots to look forward to! With thoughts of fall cooking, this past week’s recipe contest on the Food52 site was Your Best Pears. As always, there is a tempting list of recipes to drool over and save (my “saved” list is huge!). One of the pear recipes leaped out at me – Salted Honey Caramelized Pears...these four words evoked an immediate taste that I needed to try. The timing was perfect since I was making dessert to bring to Shabbat dinner and was imagining sweet fall flavors. 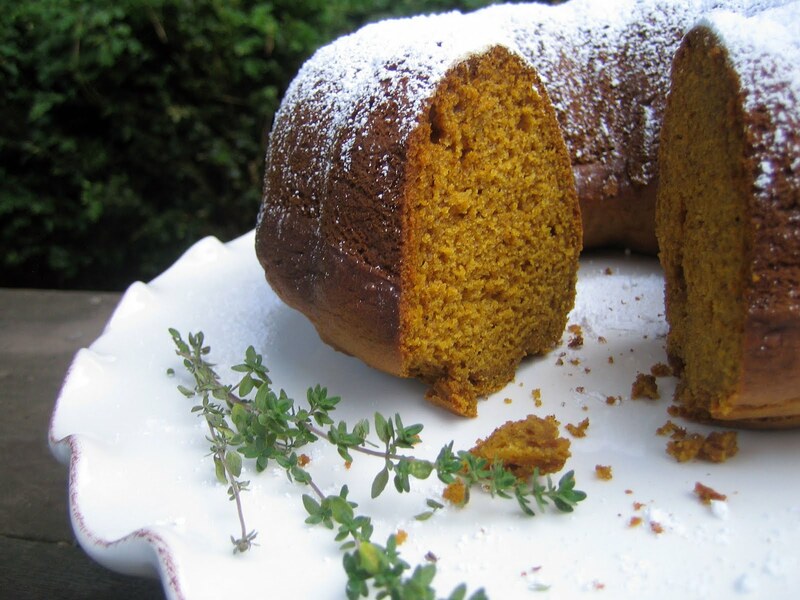 Pumpkin cake is a favorite of ours. I love its dense, moist texture and fragrant scents of cinnamon, cloves, ginger and allspice. Mmmm, the flavors of comfort. In the past I’ve served this pumpkin cake with sautéed apples and caramel sauce. This time, Salted Honey Caramelized Pears seemed a perfect accompaniment (with a dollop of whipped cream, of course) and a warm way to welcome fall. 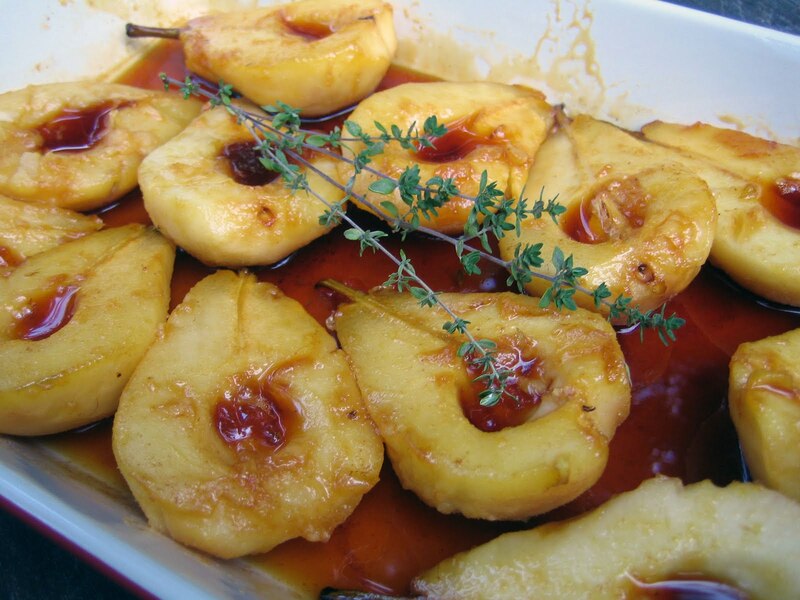 The recipe for Salted Honey Caramelized Pears can be found here (thank you to EmilyC for sharing!). I adapted it slightly since I was using six pears and do not have a sauce pan large enough to fit twelve pear halves. Instead, I made the sauce on the stove top, poured it into a 9x13 baking dish, arranged the pears on top (cut side down), basted with the sauce, then roasted the pears for 15 minutes. I flipped the pears over, basted again and roasted for another 15 minutes. Simply put, the pears were divine with the pumpkin cake! This dessert combination is definitely a new fall favorite. I hope you enjoy it! This recipe is linked back to a lovely list of pumpkin recipes, too. Preheat oven to 350 degrees. Butter a Bundt pan well. In a mixing bowl, stir together the pumpkin puree, sugars, maple syrup and oil until combined. Mix in the beaten eggs. In another bowl, sift together the flour, baking powder, baking soda, salt and spices. Stir into the pumpkin mixture until just mixed. Pour into the prepared Bundt pan and bake for about 40-45 minutes. This is a moist cake and will have a few crumbs stick to an inserted tester. Let cool and then invert pan to release cake. Serve with softly whipped cream and Salted Honey Caramelized Pears. Oh my goodness! Now this is why I love autumn. I don't have words for how amazing this sounds. I'm drooling on my keyboard! The pumpkin cake looks like such a delicious seasonal combination of flavor. Thank you, Lisa! We're definitely entering a terrific season of flavors! Those pears sound divine, salted caramel , salted honey is just so incredibly delicious. 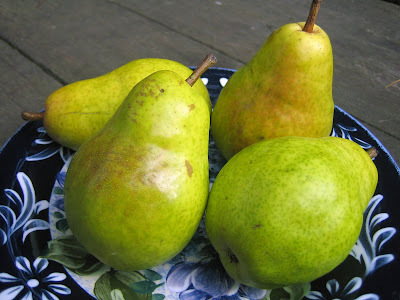 I may have to scour the vege shop for some very late season pears. Thank you, Mairi! I hope you can find some pears...they are definitely worth making. Enjoy! I love this dessert!! And since bundt cakes (and loaves) are the only ones that seem to turn out perfectly in my oven this is ideal. Thanks for submitting it to my blog hop! My pleasure, Katherine! I hope you enjoy the cake. I love how reliable bundt cakes can be.